Palo Alto, California. March 11, 2014. In a breakthrough that will help make it possible for astronauts and robots to work together in deep space, researchers at the Lockheed Martin Advanced Technology Center (ATC), working with NASA astronauts aboard the International Space Station, have demonstrated coordinated control of robots in space by astronauts in space and operators on the ground. The breakthrough is the first-ever demonstration of such collaborative tele-operations. The maneuvers create new opportunities to extend the reach of human and robotic missions in Earth orbit and beyond. 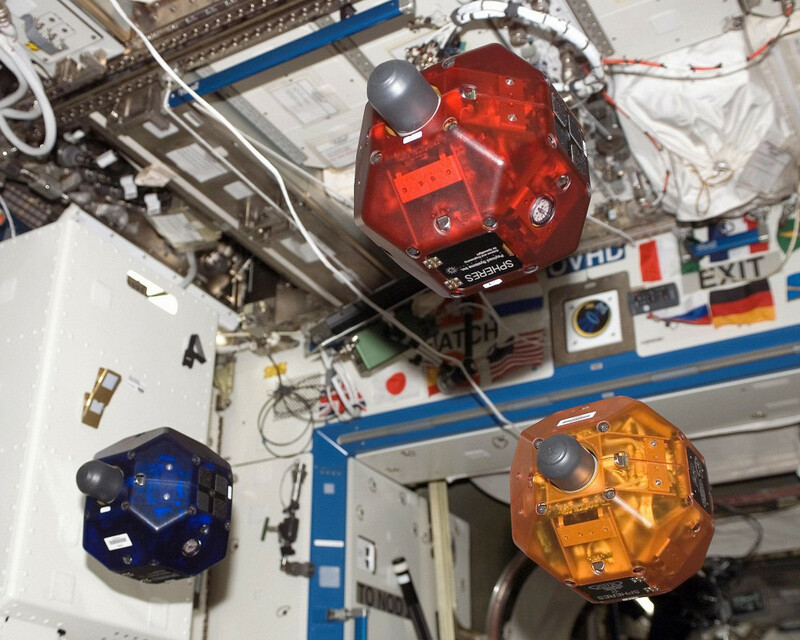 Astronaut Karen Nyberg and ATC engineer Humberto Ormeno used an ATC-developed, 3-D user interface to command NASA’s Synchronized Position Hold, Engage, Re-orient, Experimental Satellites (SPHERES) robots on the space station. Inside the space station, the robots (each about the size of a soccer ball) were commanded in “follow-the-leader” exercises and simulated approach-and-docking maneuvers, like those required for in-space assembly of large space structures and asteroid exploration. There is also flexibility within the system, meaning automated control of one or more robots can be combined with manual control of another. Remote commanding of robots in space, or tele-operation, poses several unique challenges. Commands and telemetry can take one to three seconds to travel between space and the ground via satellite relays, forcing remote operators to predict the effects of their actions using old data. Delicate components designed for weightlessness can be damaged by accidental collisions or even exhaust gases produced by other satellites, so safe maneuvering is essential. The work on the space station is demonstrating how to deal with the time delays associated with signal transfer from the ground. The SPHERES facility aboard the space station provides affordable opportunities to test a wide range of hardware and software. SPHERES was produced by the Massachusetts Institute of Technology’s Space Systems Laboratory as a way to provide the Defense Advanced Research Projects Agency, NASA and other research institutions with a test platform for metrology, controls and autonomous technologies in formation flight. It acts as a free-flying platform that can accommodate various mounting features and mechanisms in order to test and examine the physical or mechanical properties of materials in microgravity. SPHERES also provides a test bed for space applications including physical sciences investigations, free-flying spatial analyses, multi-body formation flying and various multi-spacecraft control algorithm verifications and analyses. SPHERES also is used for the annual Zero Robotics student software programming competition. NASA’s Ames Research Center in Moffett Field, California operates and maintains the SPHERES facility, which is funded by the Human Exploration and Operations Mission Directorate at NASA Headquarters in Washington.